Welcome! We will periodically post opportunities here, so check back often. 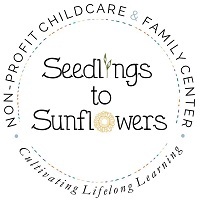 See descriptions linked below for Lead and Co-Teacher job openings at Seedlings to Sunflowers, a new 5300 sq ft nonprofit Childcare and Family Center located at 11 South Gorham Crossing in Gorham. The Center is scheduled to open June 18, 2018. Lead Teachers needed: 6 wks - 6 mo classroom & 6 mo- 12 mo classroom. Co-Teachers needed: infant classroom, 1-2 year-old classroom; 2-3 year old classroom. All positions are FT; may hire PT Floater 20-30 hrs/wk. They hope to not only encourage professional development goals, but also aim to provide opportunities for training and to support staff in following their desired career path. Seedlings to Sunflowers is committed to paying higher wages to all staff after 6 months, 1 year and beyond. Additionally, staff will be paid during center closings, offered a fair time off package, wellness reimbursement plan and eventually health care benefits. Resume and cover letter may be sent to Meghann Diggles (meghann.diggles@gmail.com). Nanny needed for child with severe disabilities at a vacation rental in Standish, ~30 mins from Portland. Looking for someone for ~11:30-4:30, m-f from 7/22-8/3, with weekends, if possible. Pay is $20/hr, for ~25 hours/week. "We are looking someone to come relieve us around lunchtime to feed her, and give her community habilitation services per her Medicaid ISP, then feed her dinner before leaving. She's on a purée diet, so while she loves to eat, it can take a while, and the process needs to be handled carefully. She is the sweetest, most loving little child, who has a profound impact on anyone who meets her."